We are now getting into my favourite time of year when all the good stuff happens; November represents Uni finishing up for the year, my birthday and becoming a socially acceptable time to listen to Christmas music / put up the tree. But before we delve too much into that, let's recap October and November so far! I finally launched a huge project I've been working on for a while now! By project I mean entire Digital Media Agency! I am so unbelievably excited to release JDC Marketing Consultancy to the world! There is so much to it but in short we specialise in digital marketing and offer services such as; branding, copywriting, consultancy, video content, social media campaigns, email marketing, strategy creation, market research, content management, public relations and SEO strategy. It's a holistic approach to marketing small business online and what feels like a natural progression in my career as I come to the end of completing my Master in Advertising at Uni. My launch offer is a free eBook '5 Step Guide to Boosting Your Small Business on Social Media' so get your copy here. You can check out more over on the website here. Follow my on Instagram (@JDCmarketing), Facebook (@JDCmarketing) and/or Twitter (@JDCaus)to keep up to date. I actually don't know what to do with myself now that I don't have 2-3 assignments due every week. I've really allowed myself to slow down and relax now that Uni has finished for the year and my company has successfully launched. I have started getting back a fair few of my grades from this semester and I am getting top grades for every class so I am extremely grateful that all my hard work has paid off and I'm really proud of what I've achieved this whole year at Uni. I have 1 more semester to go and then I graduate mid next year with a Masters of Advertising. Yay! I managed to make it to Brisbane's Oktoberfest TWICE last month and had so much fun drinking steins of beer, dancing to German music and eating pretzels. It was also extremely fun to dress up! The weather has been AH-MAZING and I've even made it to the beach for the first time this season. Pool days have been happening on the regular and this is the time of year I am often the HAPPIEST! November is my birthday month so I also have turning 22 to look forward to. I also want to give a huge THANK YOU to every single one of you reading this right now because without you, I wouldn't be where I am today and I certainly wouldn't be in the position I am to launch my very own company. So thank you! 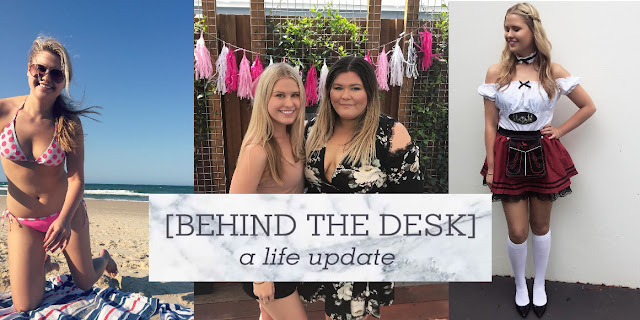 I think we'll leave it at that for updates but I am so glad I've finally had time to sit down and write a little catch up for you!